We know that high quality materials do contribute to high prices of mattresses, so we cannot expect a lot for a mattress under $100. However, sometimes prices can also fool us, which means the quality isn’t worth the money. Here are some tips that may help you choose smart. First is the firmness – each individual has different sleeping position requering appropriate firmness level of the mattress. Low price doesn’t always indicate that the firmness level of the mattress isn’t just right for you. You can choose the right mattress firmness for your comfort and support without compromising the mattress price. Second is the thickness – the thickness of the mattress is another factor that many times isn’t affected by the price. It is important to consider the size of the person for whom the mattress is needed. People may have different preferences for the thickness levels. Some types of materials can become too soft shortly after buying if the mattress isn’t thick enough. Especially, when mattress is used by overweight person. The general rule is, the heavier sleeper the thicker the mattress should be. Third is the outer look – when it comes to choosing an inexpensive mattress, you shouldn’t take the aesthetics of the mattress as an important factor to consider. It’s because high prices usually bring the luxury looks, but so many times they fail in providing proper comfort and support. So, there is no need to take it as a top priority when choosing the best mattress for you. I don’t want to emphasis the quality of the following mattresses. And, we have no intention of exaggerating what they don’t actually have. 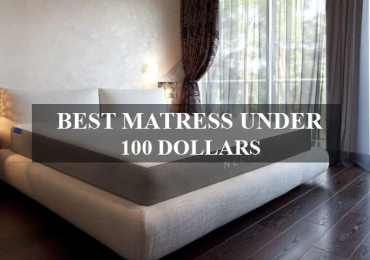 However, all the mattresses chosen below are worth the money, but the cons are, you might not find your preferred size at under $100. One thing is for certain that the Twin size is never over $100 on the list below. This Best Price mattress would be worth your consideration, if you are looking for a best Twin mattress under $100. What does this mattress have? It has a construction made of 1.5″ Memory foam top layer and 2.5″ high-density base foam layer. Meanwhile, the 100% poly-Jacquard zippered cover allows itself to be washable. In general, the mattress has the great softness that can make you feel comfort, but never ends up with stuck feel. More ideally, along with using as a night’s bed, this Best Price can be used for camping, overnight guests, and sleepovers. That’s because it is designed to be easily transportable and stored away when not in use. In addition, it can be good to place on top of your old mattress because this mattress just has 4 inches in total thickness. How about warranty? This Best Price will include a 5-year warranty when you purchase it. This Zinus is made of combination of 1 inch Memory Foam, 2 inches Viscolatex Responsive Foam, 1 inch High-density Base Support Foam. This makes it have necessary softness that won’t cause any discomfort while sleeping. However, the foams used aren’t shortened up easily after buying. Instead, it has the great firmness that prevents you feel the solid floor in case you place it directly to the floor to sleep. Besides, the materials are also good at durability that can make the mattress lasts longer. What else? It is designed to be foldable, which helps more convenient for storage or taking somewhere. Hence, it can be used as a camping bed, or an overnight guests’ bed. 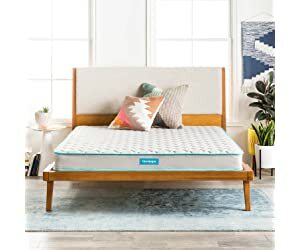 Additionally, the memory foam, and BioFoam used for this Zinus is infused with natural ingredients to help absorb moisture, eliminate odors, and keep your mattress fresh. 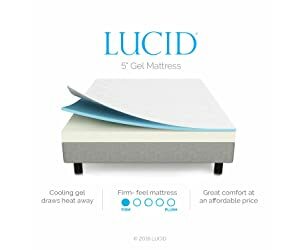 This Lucid mattress is constructed from two layers of foam, including 1″ soft, ventilated cooling layer and 4″ supportive base foam layer. The foam is fairly good at conforming to your body shape. Along with that, it is infused with cooling gel, and combined with ventilated feature, resulting in cooling feel through the night. Additionally, this model from Lucid is designed to provide firm feel. This makes it suitable for back and stomach sleepers. Even some heavy sleepers can use it. If you are wondering the weight limit of this mattress, the answer is it has ability to hold up 400 lbs. 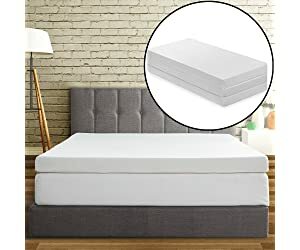 apart from these, the short height and firm feel make it ideal to firm your mattress up, so it is also suitable to upgrade your old mattress. Lastly, if you buy this Lucid mattress, the company will give you 10-year warranty. Linenspa is an innerspring mattress built from a system of heavy gauge tempered steel coils, and quilted fabric cover and foam layer. This top layer provides the softness and cushion for sleepers. Meanwhile, the coils create the bounce and responsiveness for the mattress. This results in an exceptional comfort and support. Other benefit of innerspring mattress is great breathability. The system of steel coils allows more air to flow through the mattress easily, and then improve the breathability for the whole mattress. 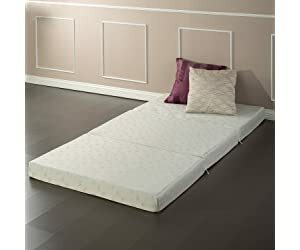 Additionally, though, noise is the big concern of cheap innerspring mattresses, this Linenspa doesn’t make any noises during your movements on it. What else? You can choose the Twin and Queen size at under $100, but the larger sizes than these can increase the prices. Lastly, the company will offer their customers a 10-year warranty when they buy this Linenspa innerspring mattress. 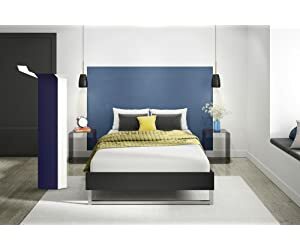 This Signature Sleep Memoir is constructed from 2 inch top layer of comfortable memory foam, and a 6 inch layer of high density 9 ILD, 2 pound memory foam. These good quality foams can provide the mattress a balanced support. Along with that, it can minimize pressure points across your body, and, distribute your body weight across the surface of the mattress evenly. Plus, the mattress isn’t too soft or too stiff, which can help your keep your spine alignment in a proper way. Due to these features, it results in a great support and comfort. Additionally, the cover is made of breathable fabric, which adds an extra cooling feel for the mattress. More ideally, it is fairly soft to touch. This feature enhances your sleeping experience. This mattress has capacity to encompass the comfort of memory foam. There are features to minimize pressure on the body and providing a balanced support. This mattress creates perfectly personalized and balanced form around the body. 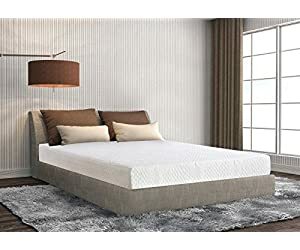 This memory foam mattress supports body weight in the most comfortable way and relieves all sorts of pressure focused on the pressure points of shoulders, hips, and feet. At the same time, it eliminates motion disturbance. All this in combat results is a unique and extraordinary sleeping experience. The set provides lasting comfort, with a dense foam core that ensures years of unrestrained durability. View full review Olee Sleep brand. 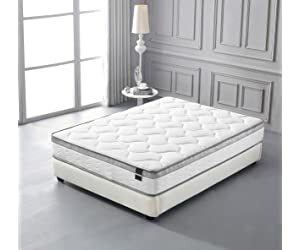 This product is offered with special Memory Foam Formula Memory foam that creates a comfortable sleep surface by conforming to the curves of the body. It creates an individualized experience that aligns the spine and eliminates pressure points. This LUCID mattress topper features 3 inches of a specialized memory plush foam formula which airy and responsive. 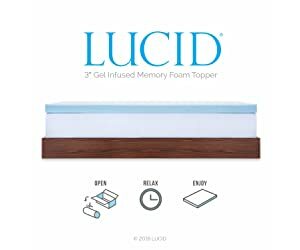 Gel Infused is used for Temperature Control LUCID infused plush memory foam with a gel material that regulates temperature for improved comfort. The gel material captures and distributes body heat to prevent overheating. The ventilated design improves Airflow ensuring comfortable and breathable sleeping surface. While the topper is taken out of the packaging, this will start expanding and grow. The packaging itself is a wrinkle-free, tearless and creases and thus brings a feeling of sobriety. The LINENSPA 5 Inch Gel Memory Foam Mattress is induced with the benefits of memory foam and firm support. 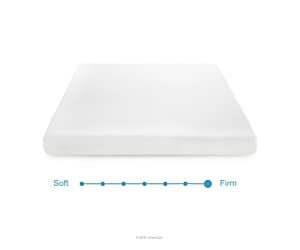 The comfort layer at the surface features a 1 inch layer of gel infused memory foam that packs together in hugging of curves and alleviate pressure. The infused memory foam with gel material helps to distribute heat that helps to maintain a comfortable temperature. Beneath the comfort layer, a 4 inch layer of high density support foam offers a support for waking up refreshed. This mattress is a low profile one, thus is a perfect fit for bunk beds and trundle beds. It is provided with soft, breathable fabric cover. It comes with a 10 year warranty from the manufacturer. Modway Emma is constructed from a combination of two layers including 0.75 inches of memory foam, and 5.25 inches of responsive foam. The combination of two makes it unique in comfort and support. Especially, the responsive foam can provide a bit bouncy feel. Along with that, a polyester quilted cover also adds an extra cushion and softness to the mattress. How about heat retention? The mattress does absorb and retain heat, but it can manage to keep it at bearable level, so sleepers won’t sweat during the night. Lastly, if you are skeptical that thin in thickness may lead to being soft, it isn’t too soft at all. Oliver Smith Mattress is a pocket spring mattress that comes in 8 inches in thickness. The pocket coil system comes in 3 inches in thickness. Meanwhile, the memory foam has 5 inches in thickness. In general, the mattress has the necessary softness that let you sunk down into it, but not ends with stuck feel. Along with that, the firmness of this mattress is good to use for back pain suffers, and keep your spine in proper alignment. What else? Due to the coil system, the mattress can create a bit bouncy feel that enhances the sleeping experience. Lastly, Oliver Smith mattress can perform well in keeping the sleepers cool thorough the night. Actually, to make customers believe in the quality of mattresses at under very cheap price isn’t easy. However, it is not fair a bit to be too skeptical about them. They have their own values and suit the needs of some groups of customers. 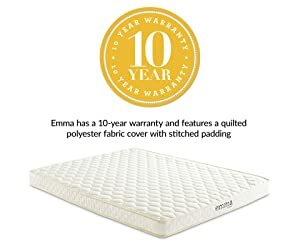 Hope with top 10 our review the best queen mattress under 100 dollars above, you will choose the best product.